Patrons come into the library asking for something different to read, they need a new author or a different genre. Here is an idea I just tried, read something you hate. I have never read short stories. If it was up to me story collections or books that say stories on the cover would not be purchased for the library. By the way the library has many books that are short story collections and I have some of them on display in the fiction area, now. I’m not sure why I thought I didn’t like short stories but I tried them and I liked them and maybe you will too. Think of them as a trial size you don’t have to read the whole book to decide if you like the author. When last I blogged I was reading biographies and I had just watched a DVD from the library called Sylvia based on Sylvia Plath’s life. Since I had never read anything she wrote, I thought perhaps I should. Johnny Panic and the Bible of Dreams contains short stories, prose, and diary excerpts that authentically take you back to the 1950’s and early 60’s. With short stories you can pick and choose and just read the ones that grab your attention but I ended up reading every one and sadly wanting more. She didn’t become famous just because she died, as I always suspected, Sylvia Plath writes a fine story. Author Alice Munro was recommended to me by another staff member; well my boss actually so guess I better read one of hers. The View from Castle Rock is a short story collection but it reads much like a novel. Alice Munro researched her genealogy and wrote fiction stories around the facts that she found. 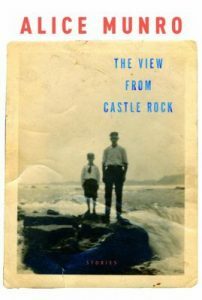 The book includes Scottish history, immigrant stories, and homesteading in Canada. Everyone would enjoy reading it. For even more short stories, essays, and poetry check out a copy of The Sun a magazine that one of our patrons donated a subscription of to the library. If refreshing new authors are what you need, try checking out the Young Adult section of our library. You will find Before I Fall by Lauren Oliver there. It is not a short story but a novel that combines ideas from two of my favorite movies Groundhog Day and The 10 things I hate about you. I think it would be a good choice for a book discussion group of any age. Many lessons learned and difficult choices are made by the characters in the book. Need a good book to read? Come into the Lewistown Public Library and check one out.